In short, the New Wave Enviro 10 Stage Water Filter System is definitely suitable for rented apartments or a small family of 4 leaving in the house. The annual maintenance is affordable and it is easy to be install in most of the kitchen faucet. RECOMMENDED! New Wave Enviro is a relatively new company in the water treatment business. 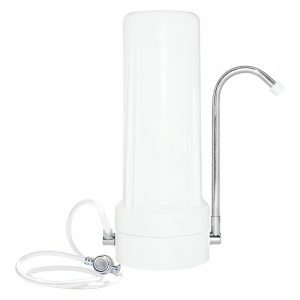 However, they have one product is listest as the best seller for countertop water filter system. One of it’s eye catching elements is the 10 filtration stages is embedded in one canister filter! Although the system was not been certified by either WQA or NSF, most of the customers agreed to have experience some improvement on the water quality with the system. 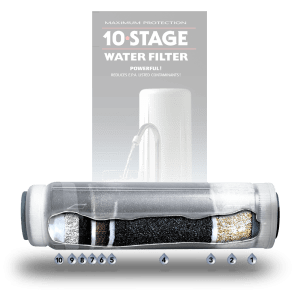 What is in the 10 Stage Filtration System? 5 Micron Pad – Polishing filter for sparkling clarity. 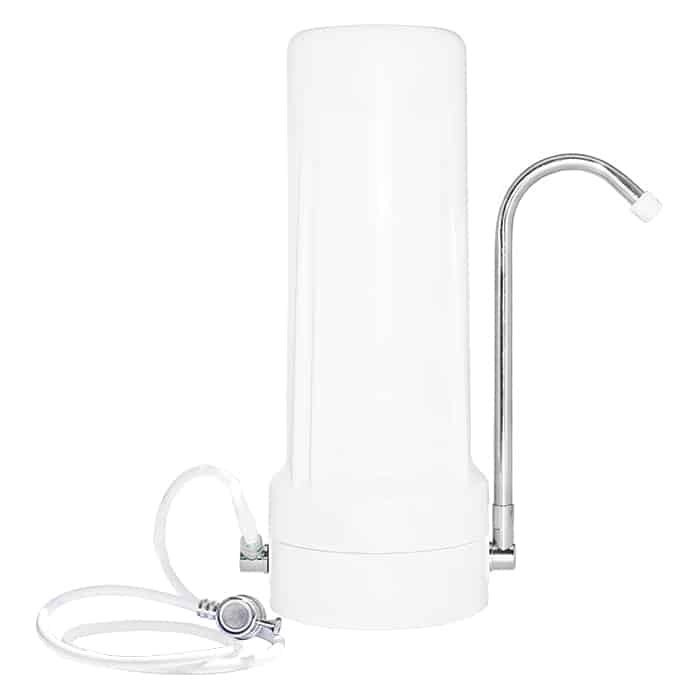 This water filter system is stylish and super portable. As it only consists of one canister filter, transporting the system is extremely easy. Hence, it is suitable for young adults or students that are renting a temporary accommodation. The installation process for most of the counter top water filter systems are simple. The faucet connector can be easily connected to any standard faucets within seconds. After the installation, let the new system to drain for 10-20 minutes and it is ready to use. 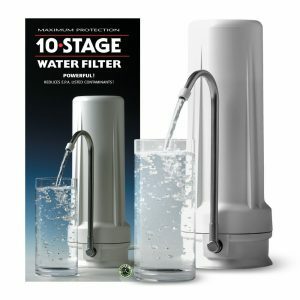 There is no complicated filter replacement for the New Wave Enviro 10 stage water filter system unless there is a leak. Otherwise, it cost $50 annually or for every 1500 gallons. It is a year of usage for a family of 4. This system comes with one year warranty and 30 days unconditional money back return. You are risk free to try on the New Wave Enviro 10 stage water filter system. The major drawback is it is not able to handle rough condition. The system is best for city water which are less contaminated. Well water source is not recommended as the contaminants will stuck in the filter and reduce flow rate. Great Filter: 10 stage filtration system which removes the majority of the city water contaminants. Patented Technology: The filtration technology in this filter is patented. Affordable Cost: With just $50 per year, it is consider affordable in the countertop water filter category. Check the latest price on my number one online trustworthy store, Amazon. Click on the button to get the recently updated price and find out the reviews of the product by all happy customers. Thank you for this detailed review. It’s funny how sometimes you’re looking for a certain product and the internet ocean takes you to a better product you didn’t know exists. You are welcome. If you have a slight bigger budget, do go for the undersink water filter systems as they are better in filtering contaminants. Please visit our 2017 Guide for Best Under Sink Water Filter System. Thanks for the great review Jay. I am concerned though that it only has a 1 year warranty. Is this normal for a filter system or are there ones that have a longer warranty? If you are looking for a longer warranty and durable countertop water filter system, the Home Master TMJRF2 comes with a 3 years warranty. Great review, I am currently looking to change the system in our house as we currently use filter jugs and it can get really annoying to fill. However, this looks super simple. Do you have to hire someone to install it, or can you do it yourself?